Standing on the Job- Just a simplified version of my idea! I few months back I lamented that there wasn’t a desk designed for use with a bike on a trainer. It was something that I had thought about a lot, for a long time. Obviously, I’m a staunch supporter of all things bike but I can also get very busy. When I would be at my desk for 10-18 hours a day, my body would start to rebel. Standard pains from years of beating up my body would spike and I would discover parts of my body hurting that I had never even felt before. Turns out this Canadian entrepreneur had the same problem, he just simplified the solution and arranged to do what I would end up doing anyway, standing at work. 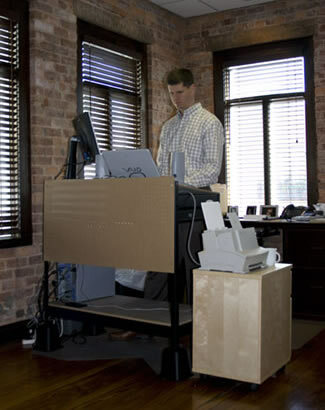 Standing up on the job – The new ergonomics for the mobile worker? “Toronto-based entrepreneur Evan Carmichael is making major life changes. Some are physical, like walking to work instead of driving. Others are material. Like forsaking men’s dress shoes for a pair of Vibram FiveFingers. The footwear resembles colourful frog’s feet and, yes, Carmichael – an international speaker who has consulted with companies including Microsoft, Xerox, and Google – gets his share of stares. TELUS Talks Business – a knowledge hub for business conversation. This entry was posted in Car Free, Urban Bike and tagged FiveFingers, Google, Microsoft, stand up desk, Vibram FiveFingers. Bookmark the permalink. 1 Response to Standing on the Job- Just a simplified version of my idea! I am on my feet all day between work, walking and biking. I wear Birki clogs at work and Vibram Five Fingers everywhere else. I highly recommend them!